Dr. Navid Javadi began his journey in dentistry at Oregon State University. He received his Doctor of Dental Medicine from Oregon Health and Sciences in 2004. Dr. Javadi’s post-graduate training took him to TUFTS School of Dental Medicine in Boston, Massachusetts where he spent a year in residency. His residency consisted of hospital dentistry for the underprivileged, which encompassed numerous hours of dental surgery with well- known, and highly accomplished Oral Surgeons and Dental Anesthesiologists. Dr. Javadi holds over 8 years of diverse clinical experience. 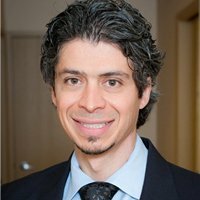 With an unyielding quest for knowledge, he is dedicated to staying on top of the latest techniques and resources to provide the absolute best care for his patients. To stay proficient with new advancements in dentistry; he attends numerous continuing education courses and has joined several study groups. Dr. Javadi has completed residency courses with Nobel Biocare in advanced Implantology and soft/hard tissue reconstruction. His areas of special interest span from cosmetic dentistry and full-mouth rehabilitation, to Pediatric and Orthodontics, Endodontics, Oral Surgery and Implant dentistry. He enjoys interacting with his patients and places their oral health in the highest regard. As a result, he is dedicated to promoting preventive care. Dr. Javadi practiced general dentistry in Tempe, Arizona for the past 6 years before relocating to San Diego in May of 2010 when he purchased his private practice now called Javadi Smiles. The focus of his practice is “Uncompromised Family Dentistry” with an emphasis on exceptional customer service throughout the patient experience. Dr. Javadi is committed to each patient he meets and thrives on serving his community for better dental health by providing excellent dental care with the support of a compassionate well-trained team.